After last month's jam-packed month of reviews with Retro Review Month, August has been pretty bare. In fact, the only review that has been posted was actually a guest review, not even by me. Well, that is about to change with this influx of new reviews. Apart from this one, there will be two others this week. To kick off the review rush, we have Spirit Camera: The Cursed Memoir, a game published in North America by Nintendo and developed by Tecmo-Koei. Nintendo 3DS owners have had a taste of augmented reality with the prepackaged AR Cards that came with the platform and the built-in software of Face Raiders. 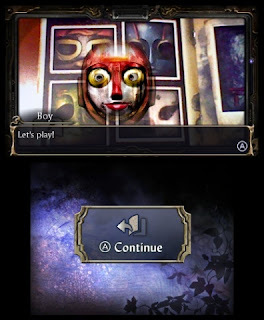 Now, Tecmo-Koei is providing a spinoff to their haunting Fatal Frame series for the 3DS, in hopes of creating an authentic augmented reality experience inside the series's universe to excite those aforementioned owners who would like some more AR astonishment. Unfortunately, the only astonishment players will feel with Spirit Camera: The Cursed Memoir is just how awful the execution really is. The premise of Spirit Camera is promising. 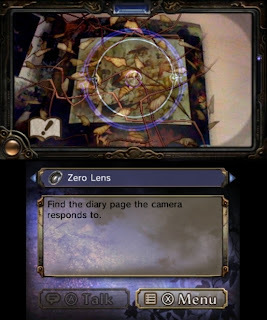 The game has you coming upon a mysterious camera known as the Camera Obscura, which your 3DS plays the part of, and a multi-page booklet, the Diary of Faces, which your portable can read. You enter inside a dilapidated, dank, and dark home where you come across a door. Before you can open it and enter, a ghost of a girl, teenaged in years, stops you. She reveals herself to be named Maya, and informs you that beyond the door is a woman in black who steals the faces of her victims, unfortunate souls who have become trapped within the pages of the memoir. You wish to forgo this fate as you team up with Maya to have her help you and remember her past. The plot has plenty of twists and turns, and it will pique your curiosity, pending you can manage to survive the gameplay. 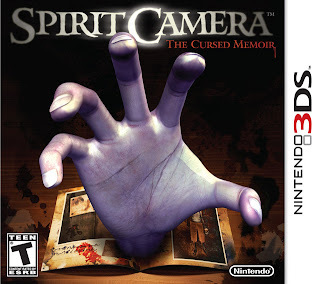 The problem with Spirit Camera is that -- for the most part -- it is essentially sensationally broken, and the fact of the matter is that the game is nowhere near "worth it" to justify all of the trouble you have to go through just to play it properly. Well lit room, completely killing off any atmosphere the game attempts to exude? Check. Impossible to play in battles unless you are standing or in a swivel chair? Check. 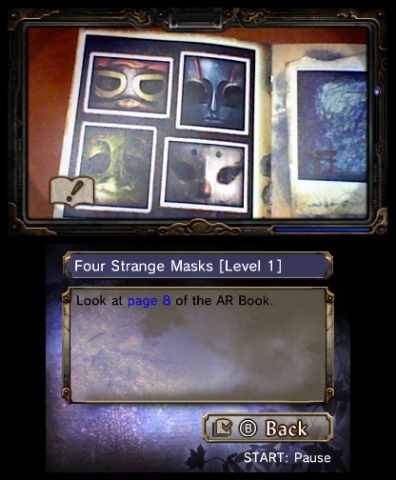 Requires you to hold the AR booklet (the Diary of Faces) down with one hand, trying to wrestle with the 3DS with the other just to hope that the camera is at the correct angle and correct distance away from the booklet? Check. Constantly having the AR booklet out of the range at the most inopportune moments? Check. Needing to hold down pages of the booklet for it stay down and be readable to the 3DS's camera? Che-- well, you get the picture. Actually, that's probably the only picture you will get with Spirit Camera as nothing works well at all. The coolness factor of the AR is short-lived. I was facing a boss in the third chapter. It was a three part battle with a demure-looking hand that popped out of the memoir. 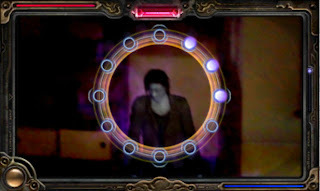 The general idea behind battles is that you try to capture a spirit within a circle on the top screen. As you have the spirit within the circle, the power meter charges. Once it is full, you can utilize the camera's shutter to unleash an attack. However, these are best used when a spirit is about to strike. The circle around the targeted spirit will glow red, prompting you to let loose a counteroffensive, dealing devastating damage (more so than with a non-counterattack) to the ghost. The objective is to dwindle down all of the enemy's health before it does the same to you. Most battles do not require the booklet, and just have you spinning around as you search for the spirit in question. An indicator on the left or right of the circle shows which direction the spirit is located. Move over, Bill Murray and Dan Aykroyd. This is a serious ghost-busting job! In the case of the previously mentioned hand, you have to situate the booklet in a way that it stays within the 3DS camera's view while also keeping the hand in your sights for your shutter to charge up. For each of the three parts of the battle, the booklet needs to be facing a different direction. This is an effort in frustration because the AR booklet will go in and out of periods of not being able to be read. And when it can be read, the hand is ready to attack. Good luck trying to keep the hand within your view while not getting a game over. What it ends up with is an immensely irritating encounter that took several agonizing attempts just to complete. And it's not just the unrecoverable and uncomfortable (for the most part) gameplay that sours me on this title either. No, the thirteen chapter story only takes 2-3 hours to complete. An extra mode unlocks once the game is beaten the first go around, but it is just the same game with harder battles and a new costume for Maya. The developers must have known how short their game was, because they added in some throwaway set of four mini-games to try to enhance the dismally disconcerting package. These are entirely forgettable and not worth the effort of getting them to work. that quickly wear out their welcome. Apart from the battles, there are small little puzzles to solve and games within the plot to play. One of the more enjoyable moments took place with the spirit of a mask-wearing boy who wanted to play a game of hide-and-seek. By giving clues to his whereabouts in the sixteen page book, you have to find the page where the boy is hiding. Scanning the wrong page is a no-no. These interesting moments break up the aggravation of Spirit Camera. And even then, they are a small taste of what could have been something spectacular if done correctly and/or with better technology. as stellar as you might have hoped it to be. Spirit Camera mostly relies on characters and spirits placed in the real world. There are a few full-motion video scenes to enjoy (these can be skipped), and they look quite nice. The actual characters that invade reality via AR come off as muddy and not very remarkable in the looks department. The voice acting, on the other hand, is really well done. It's superbly acted to give a nice, haunting horror vibe. The music -- if you can even call it that -- consists of spooky atmospheric sounds and little else. Spirit Camera certainly fits the bill of a horror game in presentation, and I have to concede that this part of the game is done just fine overall. It is quite frankly impossible to not burst out laughing when trying to suggest with a straight face that Spirit Camera: The Cursed Memoir is worth its full retail asking price of $40.00 USD. It is absolutely laughable and downright insulting, and that is not just because the game is broken beyond belief. It is that the game is completely lacking on content to justify such a price, even if the game worked perfectly. I do, however, appreciate the attempt to tell an unnerving tale through augmented reality. Sadly, the only thing that will give you nightmares isn't the chilling story. No, it is this irreparably broken game that had so much potential and ambition yet is just an unfortunate failure of a tech demo. You can find a much better game in both fun and function in Face Raiders, and if you already own a 3DS, you already own that superior tech demo.